The COMPAGNIE ANTILLAISE DE DISTRIBUTION was founded in 1970 by M. Marcel-Andre Clement, fourth son of M. Charles Clement, the famous Martinican entrepreneur who developped the RHUM CLEMENT internationally. 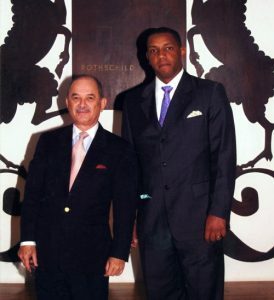 After returning from his business studies in Paris, « Ecole Superieure des Sciences Economiques et Commerciales » (ESSEC), M. Marcel-Andre CLEMENT who has good personal relationship with the owners of prestigious French wineries found out that most of these wineries were either not distributed in the Caribbean area or very poorly. He contacted some of these wineries who gradually entitled him to cover this area and then Central America. The results were extremely encouraging and with the development of international tourism in the Caribbean, M. CLEMENT decided to expand his portfolio from French wines to Italian, German and successively new world wines from USA, Chile, Argentina, Australia, New-Zealand and from more than 40 years developped considerably C.A.D influence in the Caribbean and Central America. In 2014, M. CLEMENT created a new company with his right hand partner M. Jorge MIRANDA SANCHEZ and they together founded COMPAGNIE CARIBBÉENNE DE DISTRIBUTION. C.A.D portfolio was then transferred to C.C.D who is presently in charge of it.